In 20, 25 or 30 ft lengths, Gold or Chrome, please choose length from the Drop down box. In 20, 25 or 30 ft lengths, Gold or Chrome, please choose from the Drop down box. Has soft inner and gluey material on inside edge of channel to aid in sticking to item -so it doesn’t fall off! Great for any sharp or exposed edge, ideal for Trike SVA test !!! 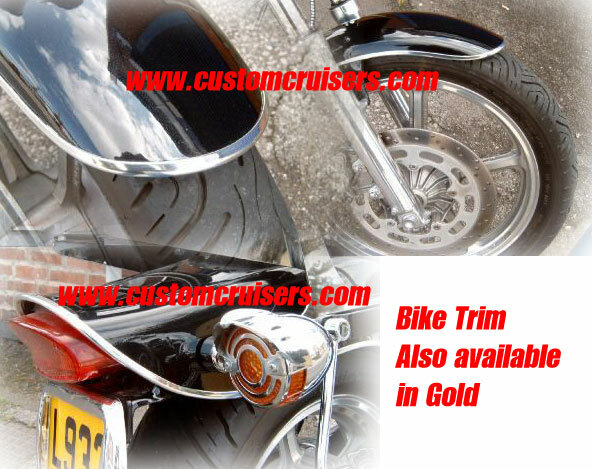 Motorcycle Accessories from Custom Cruisers Ltd.